The Hammond Development Corporation has extended the popular Associate Program to The HUB of Innovation. The Associate Program is a shared office lease option where associate tenants can rent space in a communal office at a more affordable rate than under the full time program. Tenants in the associate program can utilize a designated, shared office during normal business hours and get many of the same services that full time tenants do including access to the network copy machine, a formal business address, consulting services and discounts on incubator classes and programs. Cost is only $100 per month for a one year revolving lease and there are no penalties for stepping up into the full time program. The new associate office will be located in suite 205 and come equipped with a desk, office chair, shared computer, filing/storage cabinet and a phone extension for outgoing calls. This program has been available under Hammond’s incubation program since 2008 at the Hammond Innovation Center. It has been popuar as a step up program for start-ups who have little working capital and for established contractors who primarily work in the field but need a business address and place to occasionally come in to work. For more information on the new associate office contact Christine at (219) 853-6399, extension 105. On January 31, 2017, twenty-five NxLevel Alumni came together for an evening of food, fun, education, and networking. The HUB of Innovation hosted the event with the generous support of Centier Bank. Our guest speaker for the evening was Anna Burke, accountant and Quickbooks teacher extraordinaire. Anna’s topic, “Prep Steps for Tax Time: Hunting, Gathering & Delivering What You Really Need”, provided timely information for everyone who must prepare for tax time both from a business perspective as well as a personal perspective. The group also started its first lead generating opportunity. We had three “showcase” businesses make their elevator pitch presentations to the Alumni group. The group then had the opportunity to ask questions about each of the showcase businesses. The Alumni group was then asked to provide leads to these three businesses throughout the months of February and March. The showcase businesses keep track of all the leads they receive. The Alumnus who provides the most leads wins a great prize – an HP color copier/printer/fax/scanner for their business. The group will continue this lead generation by having three new showcase businesses at each event. We are truly using our networking abilities to help our fellow small business owners and NxLevel alums get their business to the next level! Thanks to all who participated in this wonderful evening. The Hammond Urban Enterprise Association will be placing student interns in jobs with local businesses. These interns are college students and high school juniors and seniors who live or attend school in Hammond and who show interest in working with Hammond businesses. The internship program is an 8-week paid position with students working throughout the city. This year students must be available for employment from June 5th through July 28th. The week of June 5th will be business skills training for the new interns. 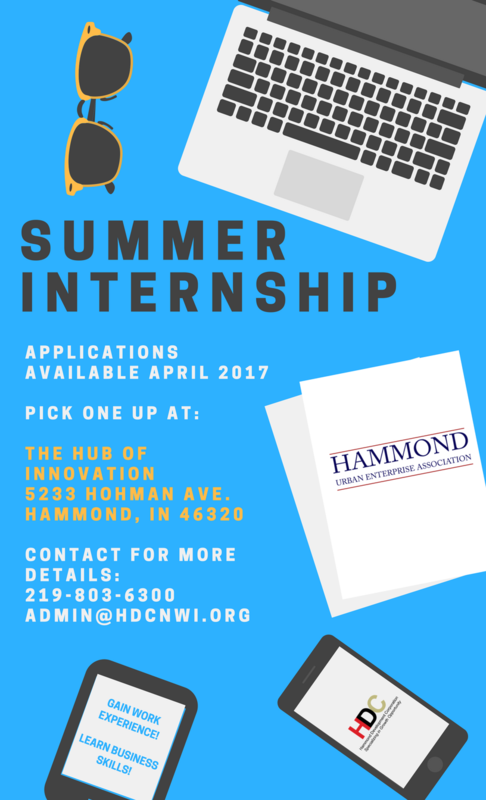 If you know a student who is interested or if you are interested in placing an intern in your business, please contact us at: admin@hdcnwi.org or call 219-803-6300 for further information. Federal income tax, social security and Medicare tax (Form 941) as well as state income tax (Form WH-1) are typically paid at the end of each month, but this can vary depending on the frequency of your payroll. When you set up your accounts with the IRS and State of Indiana each entity will give you a payment schedule. But you should be paying these at least every month in order to avoid interest and penalties or worse! A 941 Quarterly Return must also be filed four times per year - prior to March 15, April 30, October 31 and January 31. Even though you have been making payments monthly, you must still file this return quarterly. This gives you a chance each quarter to double check your payments and make sure you have not underpaid or overpaid. Federal unemployment (Form 940) may be paid quarterly or annually. Again, the IRS will let you know your payment schedule. Payment and the return must be filed with the IRS. State unemployment (Form UC-1 and UC-5) is usually paid quarterly. Payment and the return must be sent in together. All payments and forms to the IRS and the State of Indiana are made electronically. If you are using QuickBooks software, then all of these taxes are calculated in the program and all of the forms can be filled out and printed from QuickBooks. Please contact your accountant for specific questions related to payroll taxes for your business. Reclaim Our Kids has collaborated with Culture Shock Games and released first person narrative driven adventure game We Are Chicago. We Are Chicago is a game for PC/Mac/Linux that portrays the harsh realities associated with growing up on the south and west side of Chicago. Congratulations, Reclaim Our Kids! Five Star Pro Cleaning Services has acquired 40 new contracts with O’Reilly’s Auto Parts stores in the Chicagoland area. Congratulations, Five Star! Congratulations to our tenant, Weichert Realtors – Wold Group, who will be expanding into a new location. Congratulations to Exit Strategy Realty and CEO Nick Libert for having their best year to date. If you have any recent news that you would like to share with everyone, please email us at admin@hdcnwi.org.